House GOP Walks Uncertain Debt-Ceiling Path : It's All Politics The Founders knew the U.S. House would sometimes be unruly, confused and contradictory, like the very citizens the lawmakers represented. So, one way to look at what's going on with House Republicans right now in the debt-ceiling crisis is that they're living up to the expectations the revolutionary generation had for Congress, at least the People's House. 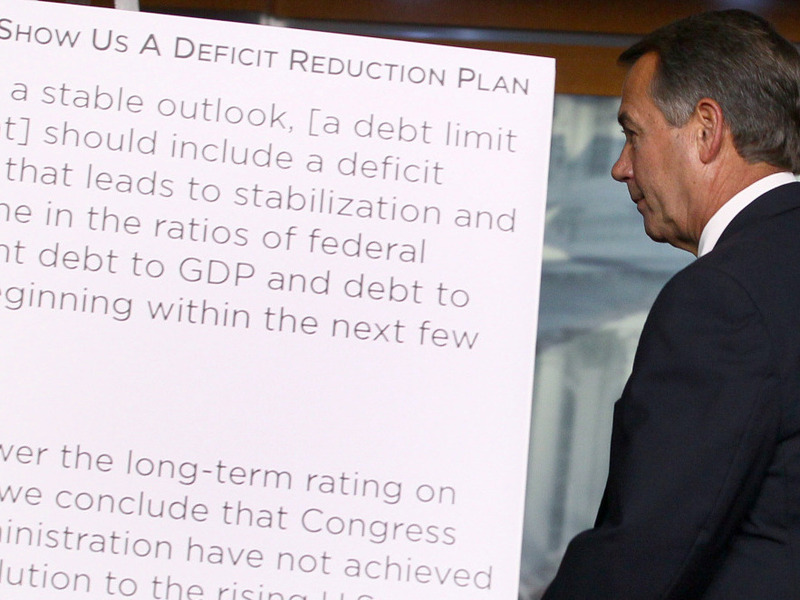 House Speaker John Boehner leaves a news U.S. Capitol news conference, July 19, 2011. The Founders knew the U.S. House would sometimes be unruly, confused and contradictory, like the very citizens the lawmakers represented. That's why they created counterweights to it. So, one way to look at what's going on with House Republicans right now in the debt-ceiling crisis is that they're living up to the expectations the revolutionary generation had for Congress, at least the People's House. The situation with the House Republican majority right now is so uncertain that on Tuesday, the day when House leaders plan to have a floor vote on the Republicans' Cap, Cut and Balance legislation, it was unclear it even had the votes to pass. And, of course, even if it did pass, the legislation was likely doomed to die in the Senate. And in the unlikely event of Senate passage, it faced a certain presidential veto. ... "This is not political posturing," one senior House Republican aide said of the Cut, Cap and Balance approach. "This is where our conference is." Still, it wasn't clear as of Monday night that the Cut, Cap and Balance plan would even pass the House — GOP leaders were still whipping their members for votes as the bill was just introduced on Friday — and it's a nonstarter for most congressional Democrats and the White House. Rep. Kevin McCarthy, the Republican whip from California, predicted the bill would pass, even though he acknowledged after a Monday evening leadership meeting that he was "still working" for votes. Cut, Cap and Balance would cut fiscal 2012 spending by $111 billion, cap federal spending at 18 percent of gross domestic product and require a balanced budget amendment. And the deadline for an agreement looms even sooner than the August 2 deadline. President Obama has said a pact is needed by July 22, this Friday, to provide enough time for legislation to be drafted and passed by both chambers. To be sure, the Senate is working on Sen. Mitch McConnell, the Kentucky Republican minority leader's plan, to give Obama the power to raise the debt ceiling without Republicans having to approve a debt-ceiling increase. The McConnell backup plan is seen as the emergency response to be used only if the parties can't agree to any other way of increasing the debt ceiling. And it appears at this point that they probably won't be able to agree. But many House Republicans aren't exactly warm to the McConnell idea, either. "I'm not in favor of making the president the debt-ceiling czar," freshman Rep. Tim Huelskamp (R-Kan.), an original sponsor of the "cut, cap and balance" legislation that the House will consider on Tuesday, said in an interview. Rep. Tom Price (Ga.), the chairman of the Republican Policy Committee, also sharply criticized the McConnell proposal. "This is just kicking the can down the road. It's what the American people are so angry about," he said on MSNBC Monday. One of the ironies of modern-day Washington is that it was Republicans who were once renowned for their discipline while Democrats were the party of lawmakers who were known for their aversion to being herded. Now it's Republicans, especially those in the House who feel some loyalty to the Tea Party and feel it their duty to buck the establishment, even of their own party. For anyone who can look at all of this with a dispassionate eye, it's a fascinating moment in history. Will Speaker John Boehner and other House leaders be able to exert authority and party discipline to reach a compromise agreement? Or will that prove impossible? Of course, it's hard to be dispassionate since a U.S. default would likely have such sweeping and terrible consequences, according to the experts, that everyone would be negatively affected, even those who deny that it would have any affect. The assumption still is that the U.S. will avoid default although the path there isn't clear even two weeks out. It's kind of like a Hollywood adventure-thriller minus the car chases and explosions but with a sketchy plot line and a number of close calls where all ends well. At least, a good ending is what millions of people in the U.S. and abroad are hoping for.